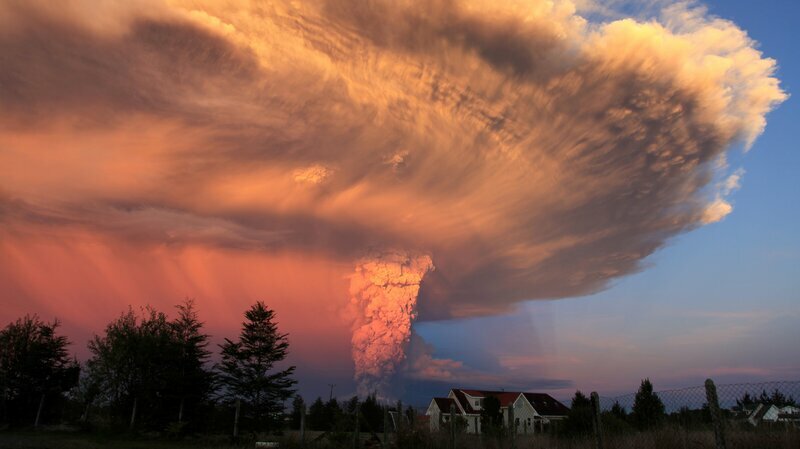 On April 22, 2015, Calbuco volcano in southern Chile began erupting for the first time since 1972. 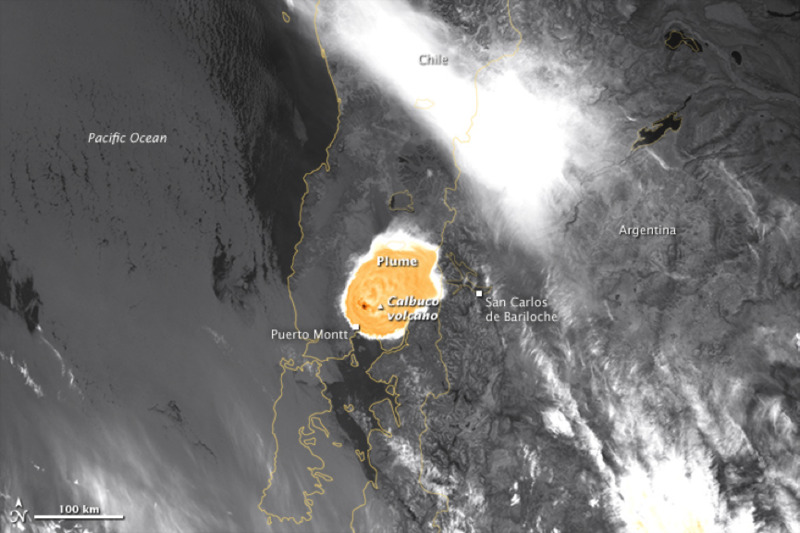 An ash cloud rose at least 15 kilometers (50,000 feet) above the volcano, the nearby communities of Puerto Montt (Chile) and San Carlos de Bariloche (Argentina) were evacuated in places where the ash load was considerable. 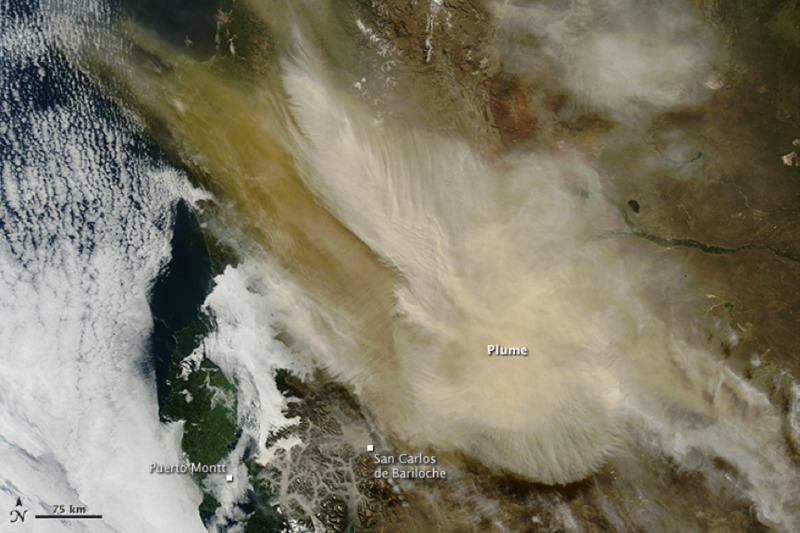 MODIS’s images below were taken on April 23 revealing the fast displacement the ash plumes took right after. 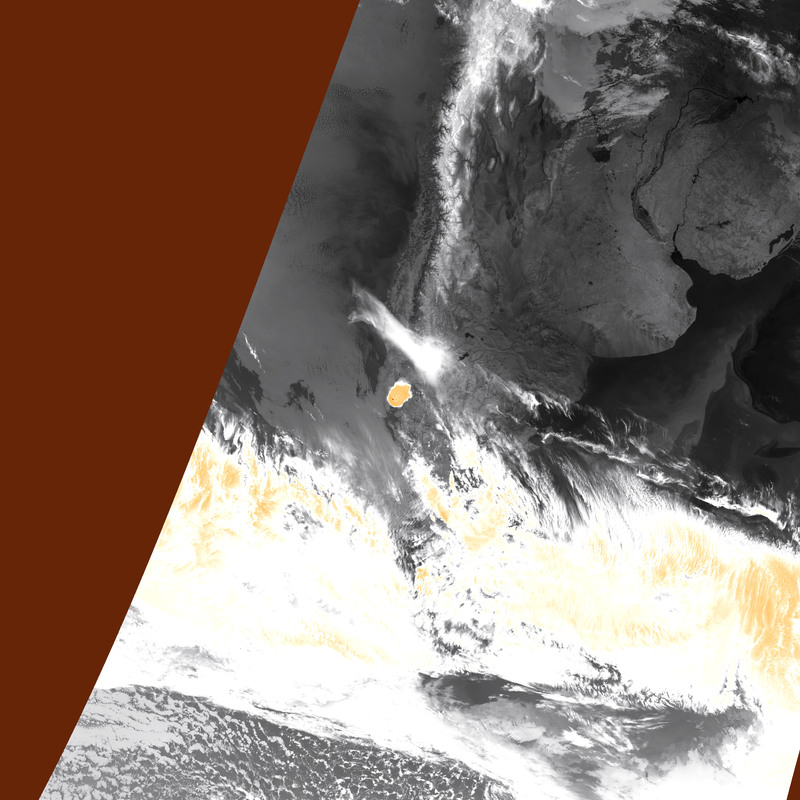 Satellite instruments also acquired unusual nighttime views of the eruption (below) in the early morning hours of April 23. 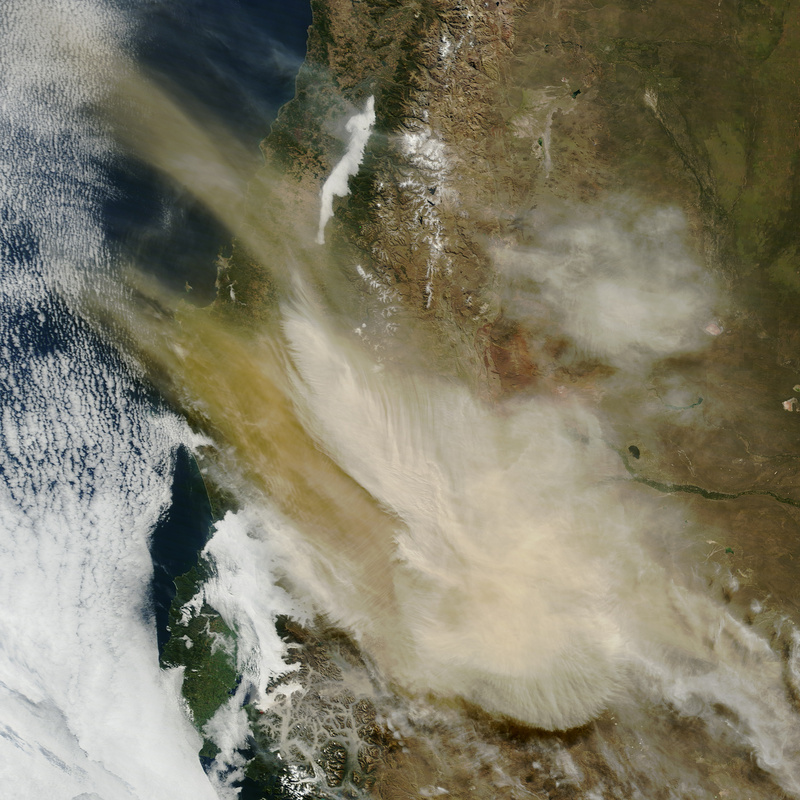 The joint NOAA/NASA Suomi NPP satellite observed atmospheric waves above Calbuco and its plume. 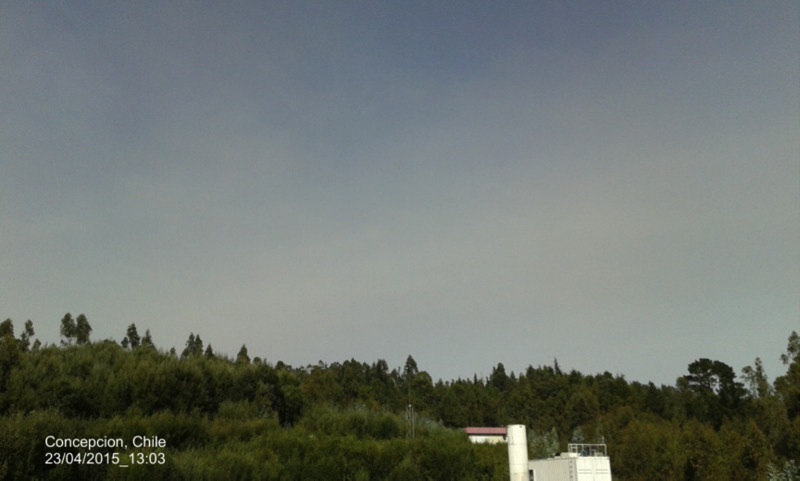 A fast warning was made for the LALINET stations to start measuring the plume evolution in height and optical properties. 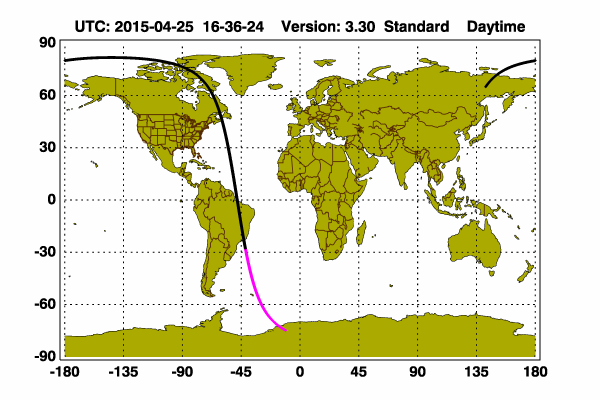 In parallel HYSPLIT back and forward trajectories have been simulated. 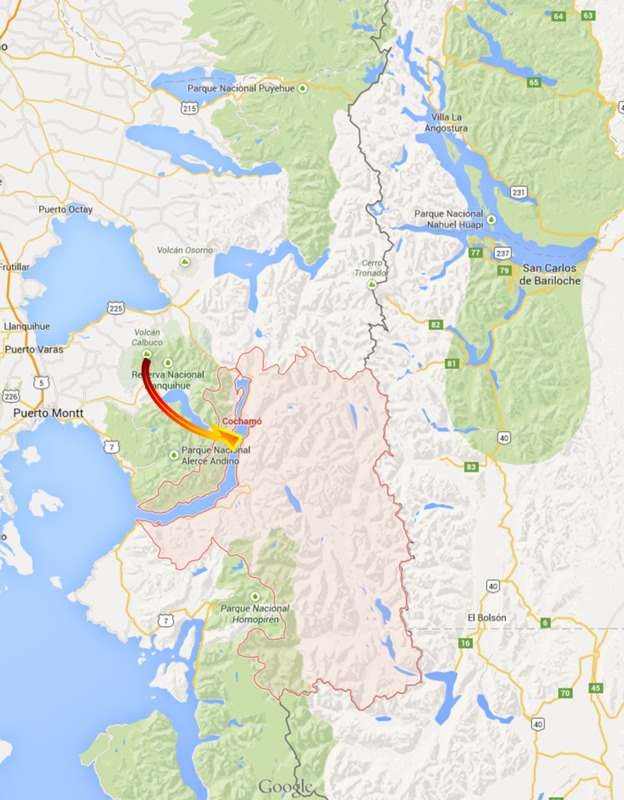 This is the Calipso overpass on the day of the eruption. Calipso overpass on April 22nd. Click to see all CALIPSO data. 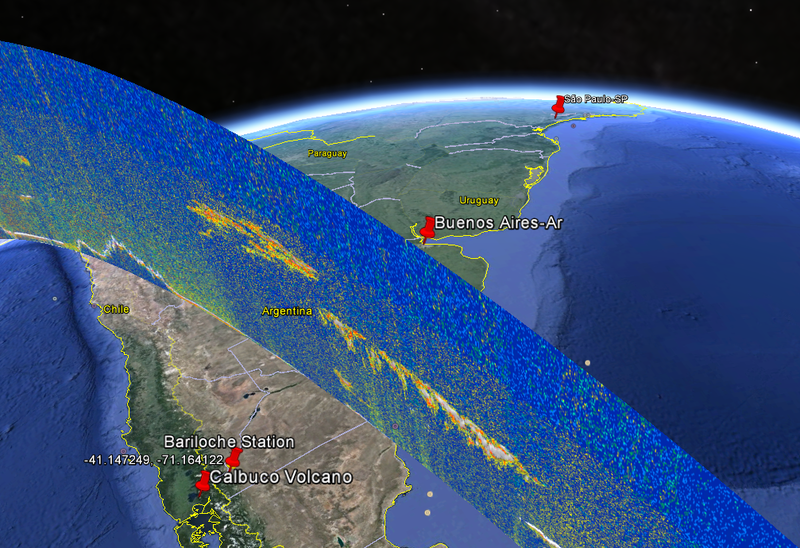 The next day, the plume was already travelling towards Buenos Aires, as can be seen in the Caliso data shown in the GoogleEarth below. Calipso overpass on April 23nd. Click to see all CALIPSO data. 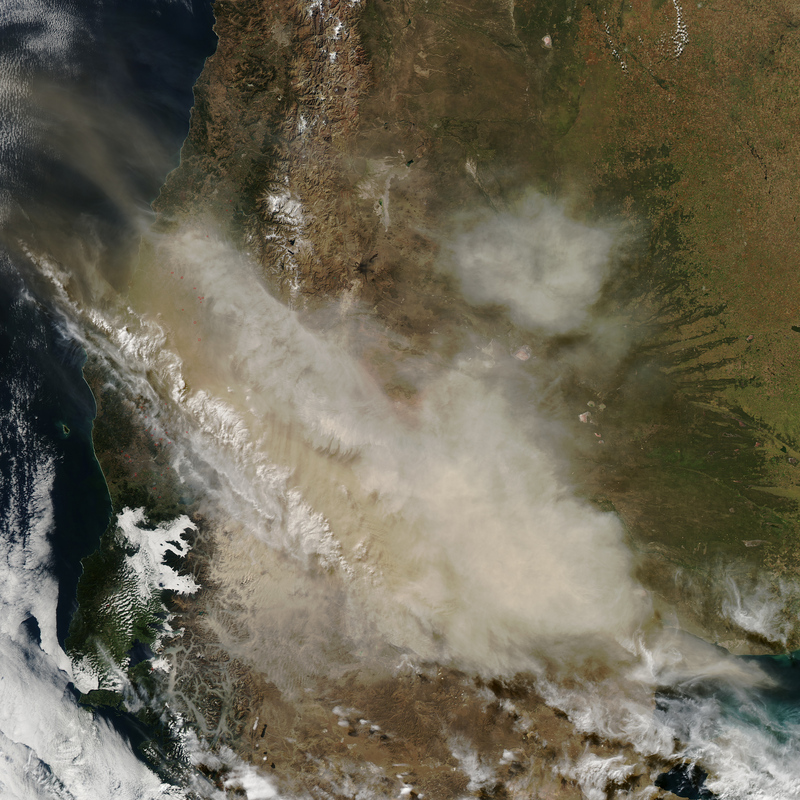 The Argentinian stations soon started to run as they already have an agreement with the national air traffic office and is in conducts operational measurements for ash identification and plume detection . Other stations in the continent started also special ops in order to observe plume events. 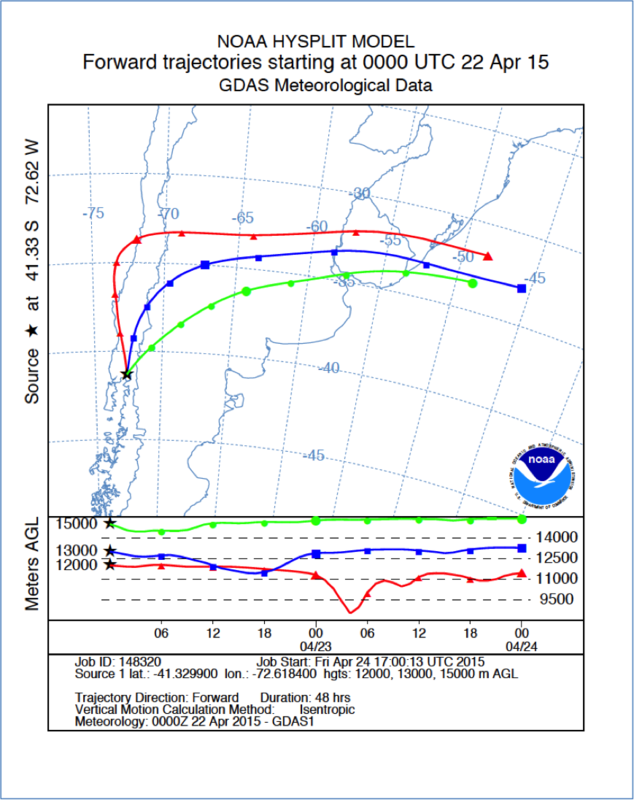 The fist observation came from Buenos Aires Aeroparque, Bariloche, Comodoro, Neuquen and Rio Gallegos stations, where plumes at heights from 3000 – 10000 m could be observed. 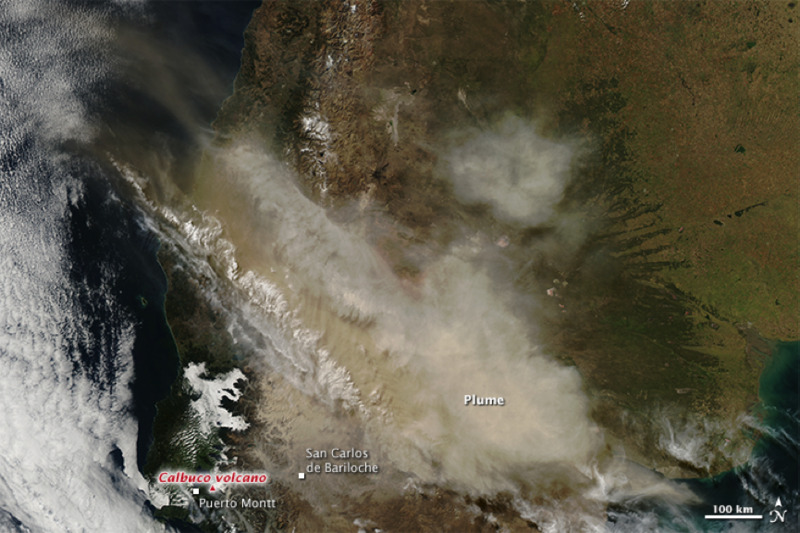 Soon after the lidar station in Concepcion, Chile, also observed the plumes, visually and with their lidar system. 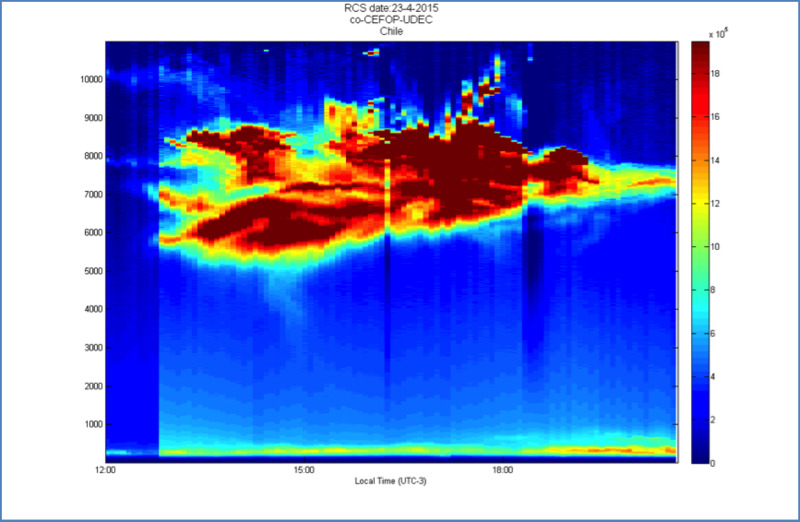 Concepcion Station lidar RCS quicklook – dust event observation on April 23rd 2015. Calipso overpass on April 24nd. Click to see all CALIPSO data. 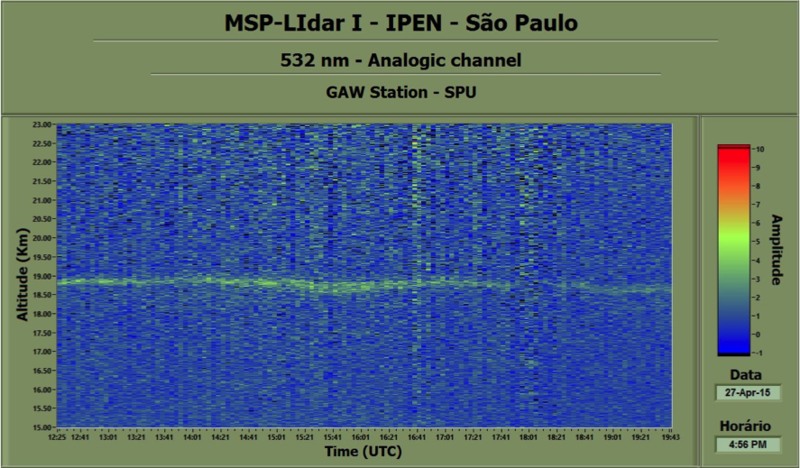 Other stations in the network were alert : La Paz (Bolivia) , Medellin (Colombia), Manaus (Brazil) and São Paulo (Brazil). 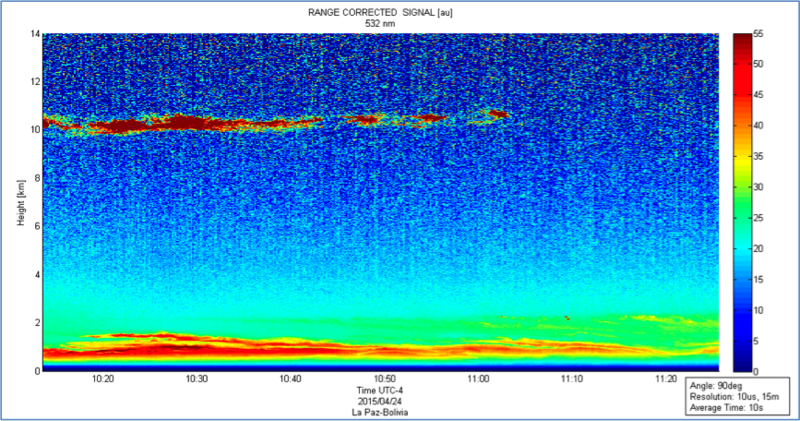 These stations are far way from the event location and plume pathways, however started measuring. 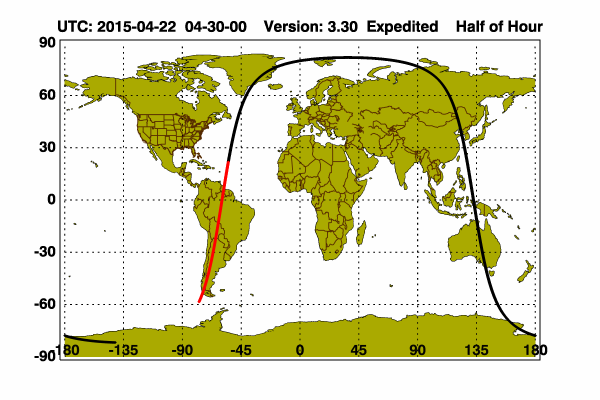 La Paz RCS quicklooks - April 24th. 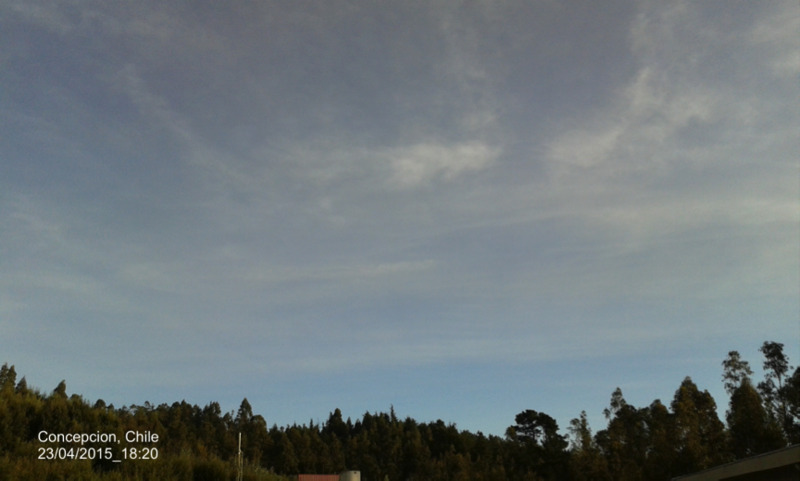 The signal at 10km is a Cirrus cloud. 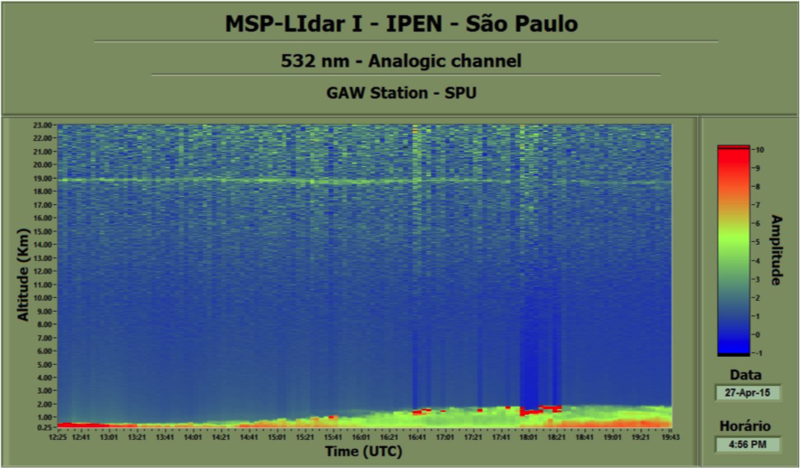 Four days after the event started, the lidar system in São Paulo detected a plume at 19000 m which could be a volcanic plume event which should be still confirmed. 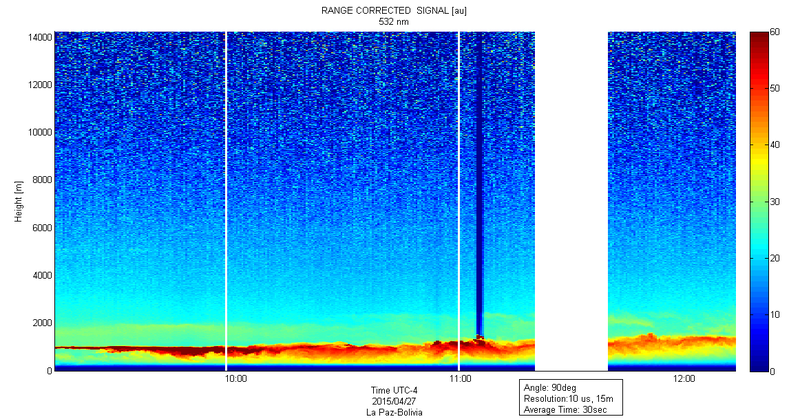 Measurements at La Paz, on the same day, did not show any sign of the volcano plume. La Paz RCS quicklooks - April 27th. are you taking data pretty much continuously? 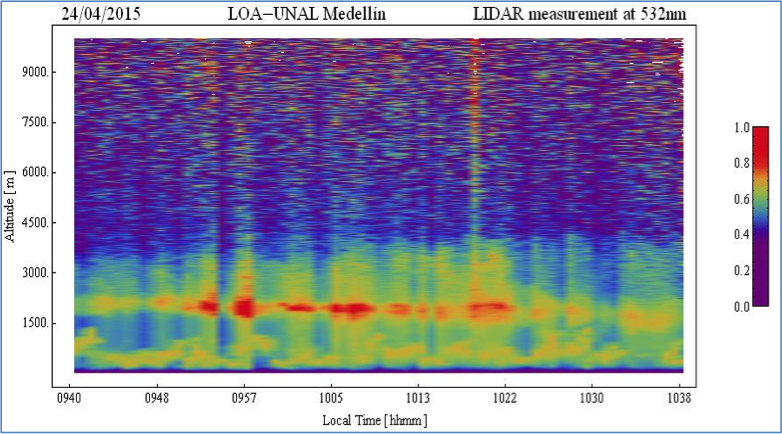 this is a report of the AUGER Raman lidar observations after the Calbuco eruptions. Please forward to whom it may concern. Vincenzo for the CRLF people and AUGER collaboration. 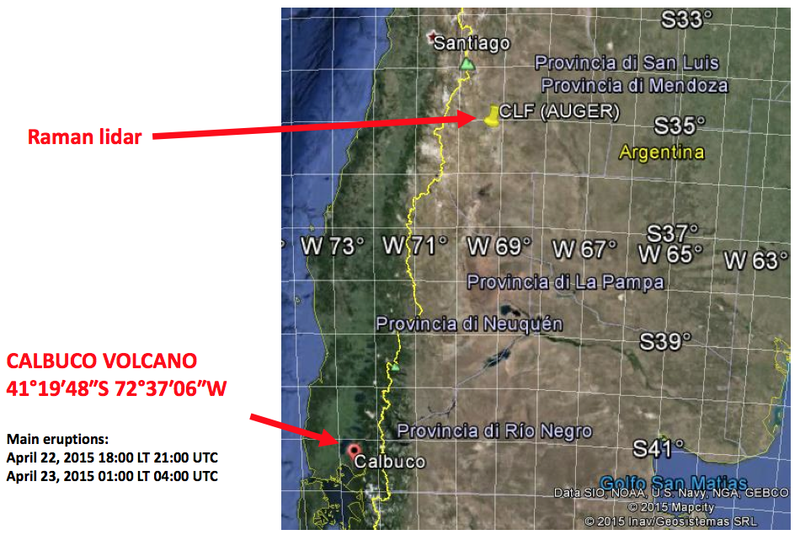 This is the last information from Chilean volcanic services.